The number one group transportation company and limousine bus rental in Ontario! If you need limo transportation services for your big parties, bachelor and bachelorette parties, weddings, proms, sweet sixteen parties, or even for business transportation, we have got you covered. We'd love to provide the most outstanding limo buses, and all you've got to do is give us a call to get started. To start, we have the biggest and most intriguing selection of party limo buses in Toronto. Our party bus hire is not only the most exquisite and most lucrative in the area, it also comes with a complete satisfaction guarantee. Furthermore, as one of the leading bus companies, we strive to provide the greatest value to our customers and passengers. We know that limo bus rentals are used for special occasions, and that is why we make sure that you always get special treatment. We make you feel like a VIP on your night of celebration. Our party limos are equipped with everything that you would possibly want. Everything from surround sound systems, to a dance floor and we even have a party bus with bathroom and dance pole for those extra special parties. You can arrange for all day transportation, even spread over multiple days, or you can just opt for pickup and drop off service if you need to save some money and still have that prestige! It's completely up to you. We can put together a customized transportation package for you that gives you everything that you need and want, and yet fits into your budget seamlessly. Working with our team is a breeze, and being on the road in one of our vehicles is a smooth experience unlike any other. Give us a try and find our for yourself! 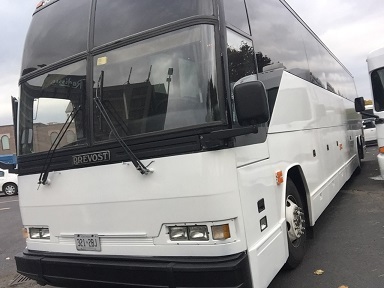 Some people rent our buses for the luxurious leather seating, for the built-in bars, for the high-quality HD televisions and sound systems, or even for the stripper poles! And some take advantage of our services just because we have the most reliable professional chauffeurs in the business! No matter what your reasons are, you can be assured of a comfortable, smooth, and fun ride, provided by drivers that are highly trained and who know the city like the back of their hand. Call us when you're ready to book your trip! Just be ready with your desired dates of service, the number of people who will be traveling with you, and the places that you will be traveling. We'll do the rest for you! Why Rent a Bus from us? One of the things that differentiate us from other providers is that we have the best maintained and most modern fleet of bus limos in the Greater Toronto Area. That includes all the modern features that you would expect from a best-in-class company. Our limousine bus fleet comes with features such as surround sound, a luxurious interior, and minibars that are stocked with cold beverages for your enjoyment. Customer satisfaction is one of the most important values to us as a company. We take it upon ourselves to provide luxurious limo service. Furthermore, we always strive to give outstanding value to our clients. We do this by having the best and most professional team of chauffeurs and drivers in all of the GTA. With our team, you can be sure that you'll arrive at your destination in style and most importantly on-time. We work hard to ensure that your vehicle arrives at the designated location on time. If you are looking for the company to provide you with the best Toronto party buses, then look no more. Our people are the core of our success. And we do it by offering the highest quality limo bus rental service to our valued customers. It is what got us this far, and it is what will take us even further in the future. You may be surprised to realize that our bus rates are more affordable that you think. With such a large and awesome fleet, we have the volume that allows us to provide outstanding party bus prices. At the same time, our quality and our selection are unparalleled in the industry including when companies with all other bus companies. Try us for yourself by getting a limousine rental quote. We know that you will be satisfied with our services, and that includes everything from price to the actual limousine bus. Some people may not be aware of exactly the of the limo party bus. In fact, it is the most luxurious form of travel that has been gaining much attention in recent years. It is not just a method of travel; it is a party on a bus! Some people may opt to rent a charter bus or even check out shuttle bus rental prices. However, nothing compares to the authenticity of a glorious limo bus party. There are multiple means to get a bus for rent. There are the coach bus and other types of vehicles that are used for group travel. We specialize in providing you with party buses to rent that are top of the line. We have busses for rent that will literally make you say 'WOW' because of the interior, the service and the elegance of the bus limo rental that you will be getting. Providing limousine bus rentals to the people of this great city has been a passion of ours. That is why we deal with your bus limousine rental as if it were a family member. Every bus for hire that we have is equipped with all the latest and most advanced gadgets and features to make your event perfect. For example, we have a bachelorette party bus that has a dance floor, excellent sound system, and laser light ceiling. We also have big party buses that can carry anywhere between forty to fifty passengers. A party buss is more than a means of travel; it is literally a party on wheels. In addition to providing the highest quality chartered bus and limo service in Toronto and the GTA, we also offer coach bus and a variety of other services to our customers. These include the most elegant wedding bus service, corporate and business event transportation as well as party busses for proms and bachelor/bachelorette parties. Getting the most outstanding rental bus in GTA is easier than you think. If you are looking for a charter bus for a day trip, a night out or a family reunion, call us today, and we can provide you with a great price on all our party bus rental services. The best bus party is the one that can leave a lasting memory on all those who attend it. Because with party bus hire, all your events are bound to be extraordinary! Feel good about your event with us. Whether it is a prom, a wedding or a bachelor party, our elegant buses are what you need to have the most perfect and most memorable event. Call today and find out more about our services. Our sound systems are extremely high quality, with loud booming speakers to reverberate your favorite songs and get you grooving! You can play your favorite CDs, or for the ultimate in convenience, just hook up your iPod or MP3 player! 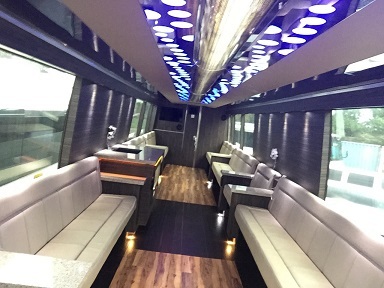 Our buses also feature gorgeous acrylic and granite bars for your drinking pleasure! Just bring your own beverages on board and you're good to go! Premium wood flooring and comfortable leather seating for long rides! We have been in business for many years, serving southern Ontario with humility, and working to provide our customers with the most exciting method of luxury bus transportation. There's typical transportation, and then there is luxury transportation, and our company is especially dedicated to providing a unique and memorable travel experience. Please give us a call today to discuss the selection in our fleet, and to select the one that is most suitable for your event. One of the ways that we ensure an affordable and safe ride for you is by inspecting our limo party buses before and after each and every trip. By keeping our vehicles in exquisite shape and having them maintained as soon as we notice a problem, we save you money and keep you safer on the road. Also, our professional chauffeurs are provided with the highest quality GPS systems in existence, to make sure that you are always where you need to be on time. Efficient travel, a high-quality vehicle, and the greatest customer service in the entire area. You get nothing but the best when you do business with us. Whether you are traveling with a small group of just fifteen friends, or a larger group of up to fifty passengers, we have vehicles that are sized to meet your needs. Our smaller buses have great features like flat-screen televisions, and high-quality audio systems and our larger buses have the same but in higher quantities. For instance, a larger party limo bus may feature many televisions and a much higher quality audio system. There are HD antennas in some of our buses to pull in live television when the vehicle is parked, and DVD players for you to enjoy your favorite movies and music videos during the ride. There are also built-in bars, coolers, and cup holders, plus beautiful lighting schemes and high-quality leather seats for your comfort. Our party buses rental prices are excellent. If you're looking for great buses for rent and don't want to pay exuberant amounts, then call us for a free quote. We have rental buses that start as low as $199 per hour. Furthermore, our limo bus hire comes with our satisfaction guarantee, which means that you get exactly the type of elegant party limousine that you desire for great prices. 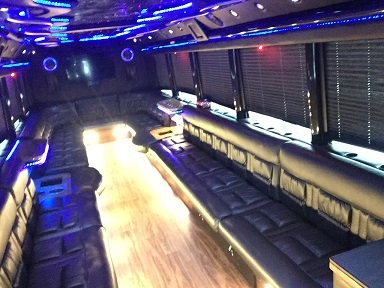 There are so many reasons to rent a party bus, and you won't understand the fun of this type of limousine ride until you head out on the road with us yourself! Whether you are planning a trip for a special occasion in life as a wedding or bachelor party, or something professional like a trip to a business convention, or something entirely different, we would love to get you there affordably and safely. Call today to find out what your options are and how we can serve you best!